It all started the morning of November 4 2006, around 9:00 A.M... I was sitting in my climber and it started to sleet. I stuck it out for a few minutes and decided to get down. I really wanted to hunt that evening since this was the first weekend and I was off my crutches since I broke my ankle. I decided to walk up to the ridge field to see if there was any rubs or scrapes that I could set my ground blind around. I arrived at the edge of the field that consisted of switch grass and small saplings. To my surprise almost every third sapling was ripped to shreds and some of the tops were snapped off. As I looked for a good spot to set up my blind I heard what sounded like two bucks fighting. I thought; what are the chances of two mature bucks fighting at 9:30 AM at the edge of the field. Then I heard them again about 50 yards away, but this time I caught an unmistakably strong smell of their scent glands. The wind was in my favor and I had a decision to make. Do I dare try to get a glimpse of these two bucks or do I slip out of here undetected and just focus on hunting this evening. I decided that when opportunity knocks to go for it. I slowly walked to the edge of the small wood line that consisted of mostly heavy cover but was only about 20 feet wide. I worked my way slowly through the field until I was about 5 yards from the edge. Suddenly I heard a twig snap only 25 feet away. I looked through what seemed to be a ve''''ry thick briar patch and there stood a monster eight pointer. It was way too thick to even attempt a shot, and since the wind was in my face I elected to stay were I was and see what happens. I could see both bucks locking antlers right in front of me and they took off running up the wood line. I thought to myself well I blew it, they must have either caught my scent or seen me. I was still in awe that this was happening. I stood there for about 2 minutes when out of the corner of my eye, coming down the field was a buck. He was heading right for me. With little time to react, I came to full draw and bent my knees to hide a little better. This buck was about a 120" eight pointer and he made it all the way down to me, standing only seven yards away. I locked my sights on his chest as he looked right at me like he didn't know what I was. Right before I could shoot I saw a huge rack coming right behind this buck and he stuck this buck with his antlers in the rear. 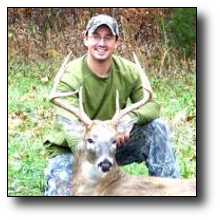 The 120" eight pointer ran to my right about ten yards. I looked back towards the other buck and he was standing in the same place that the 120" eight pointer was previously. Still at full draw I locked my sights on this huge buck standing seven yards away and I shot him square in the chest. When the arrow hit its mark, the buck had no idea what happened and started running right at me. As you already know I have only been off my crutches for a few days. I fell to my right and this huge buck darted to my left, only missing me by 3 feet. The reason I know this is that as I was getting back up to see if he was going down, the blood trail was only 3 feet to my left. This was the most incredible thing that had happened in my thirty years of being alive. I waited about an hour before I started tracking him. The blood trail was a dream; it was about twelve inches wide and very easy to follow. I knew from the blood trail he couldn't have gone too far. There he was only 70 yards from where I shot him. A monster in my book. 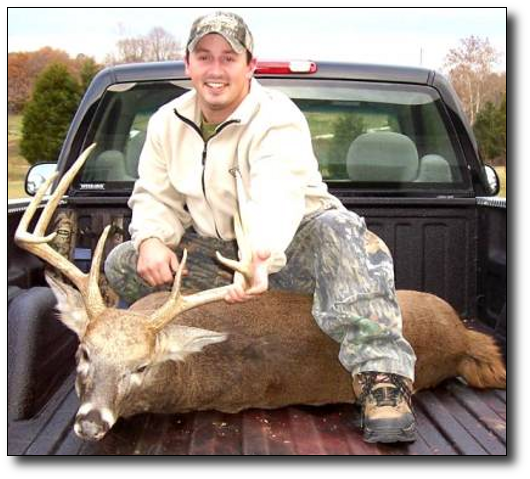 A 135" eight pointer with an inside spread of 18 and one half inches. This will probably be most exciting hunt of my career. A buck sent straight from god.